Brewery Report: Den Sake Brewery – Why A Musician Brews Sake In Oakland? – SakeTips! Den Sake Brewery – Why A Musician Brews Sake In Oakland? Den Sake Brewery is in a corner of O2 Artisans Aggregate (O2AA), an eco industrial park which is also home to popular soba restaurant Soba Ichi. Passing under a wooden sign Akinaichu (open) suspended above a steel door, I realized that inside of the brewery is quite small. 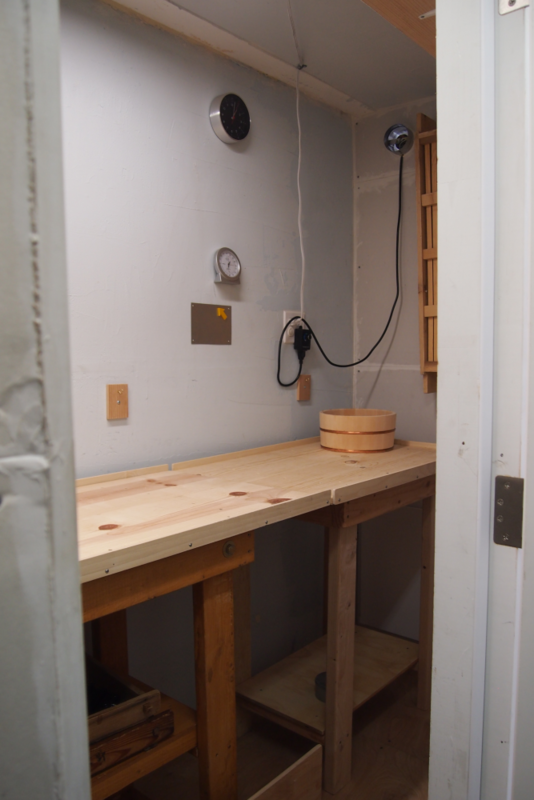 Behind a desk by the entrance, there is a tall DIY koshiki (a tub traditionally used to steam rice) and a small washstand. 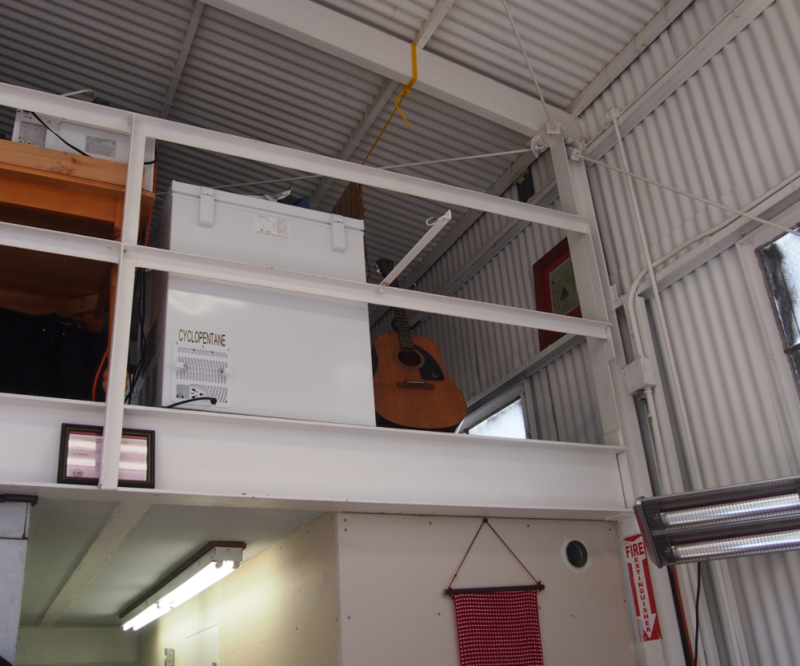 An acoustic guitar looks down on visitors from a loft on a koji (malted rice) room. Brewer Yoshi Sako, who established Den Sake Brewery, came to the US from Japan in 2000. He attended a language school where an encounter with a teacher who plays the drums inspired him to rekindle his band activity that he abandoned back in Japan. He now plays the bass for three bands: Beatropolis, a live-electronic band which collaborates with a Japanese Hip Hop MC Shingo2; Glider, a rock band launched as a side project by members of Counting Crows; and a world music band (S)ynchrosystem. At the same time, Yoshi reached a turning point in his second job for a cafe. While working as a manager and buyer for sake and wine store Corkage (closed), he found himself strongly drawn to sake. Five years later, he started working for Japanese restaurant Yuzuki Japanese Eatery as a sake sommelier and started giving sake lectures to his customers. To understand sake more and more deeply, in 2015 Yoshi started a brewing trial. 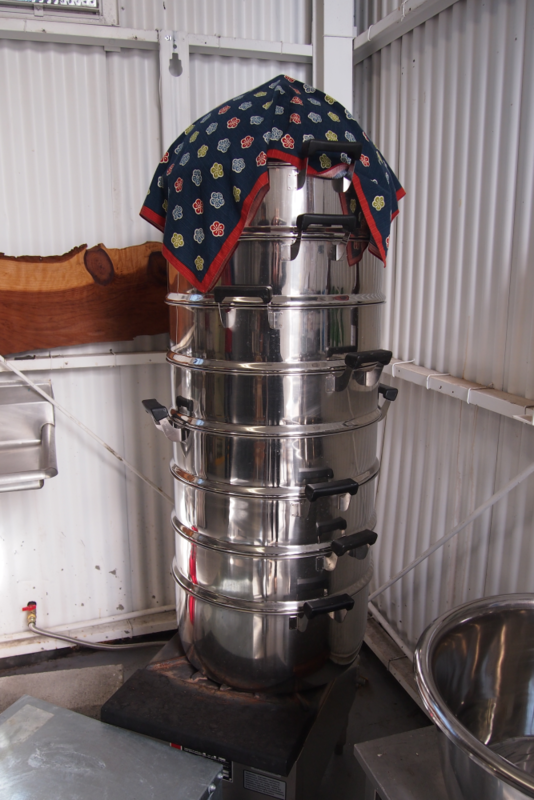 He built a walk-in cooler to use as a fermentation chamber and pitched two-ply tents as a koji room. He became addicted to the depth and process of sake brewing and, realizing this was too much to do just in his spare time, he decided to establish his own brewery. At first, Yoshi considered opening his brewery in San Francisco. 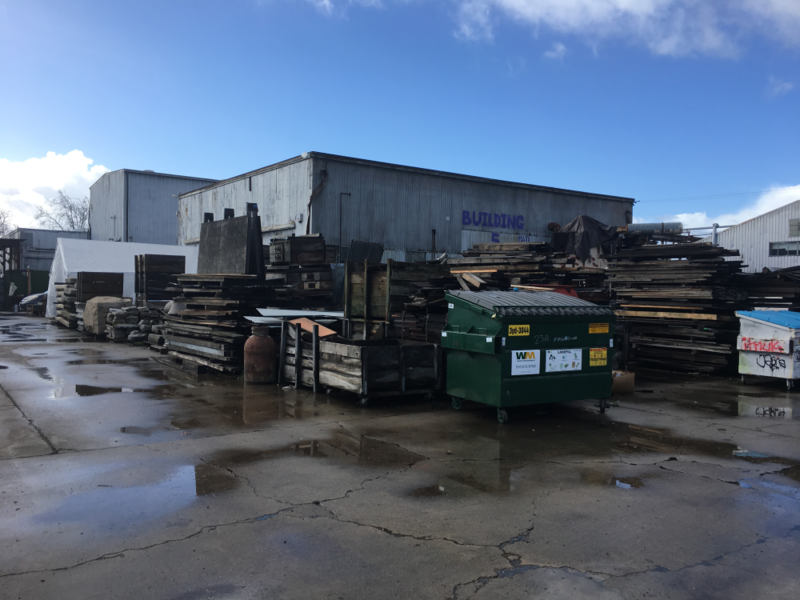 However, he eventually chose Oakland; the costs and competition in San Francisco were prohibitive, and he likes the character of Oakland. Compared with San Francisco, where the number of enthusiasts has been increasing, sake has been still unfamiliar to people in Oakland. “Such people can be more open-minded about untraditional sake,” Yoshi says. The first hurdle for starting his brewery was equipment. Because there is no manufacturer that produces equipment for sake-brewing in the US, Yoshi had to choose one of two options; import specialized materials from Japan, or make adjustments to existing equipment for wine or beer. The costs of the former were very high, so he decided to make use of what was already available here. However, it was time-consuming to research the materials of the equipment to make sure they’re harmless to brew sake. Everything – including the “cute” koji room where he can make at most 36 kilograms of steamed rice (Link to Instagram) and press machine – is made by Yoshi’s own hand (Link to Instagram). 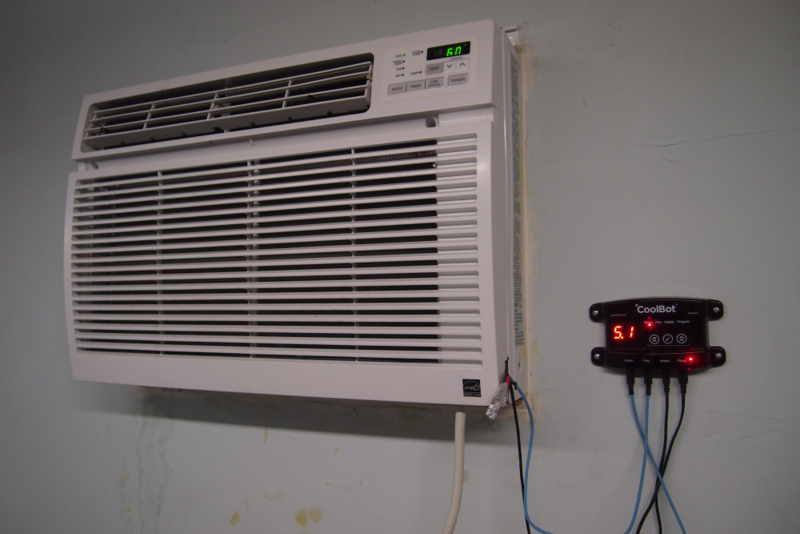 A release device of limiter allowed him to lower the temperature in the press room to 4℃ (39.2℉). “Den” means “rice field” in Japanese. As its name suggests, Den Sake Brewery uses special rice: their material rice is “Calhikari,” short grain sushi rice grown by Rue + Forsman Ranch in Sacramento Valley. In order to retain its original flavor, Yoshi set the seimaibuai (polished ratio) as 70 (30% of the original grain has been polished away). This ratio can be categorized as neither “ginjo (under 60)” nor “daiginjo (under 50),” which tend to be regarded as premium sake. 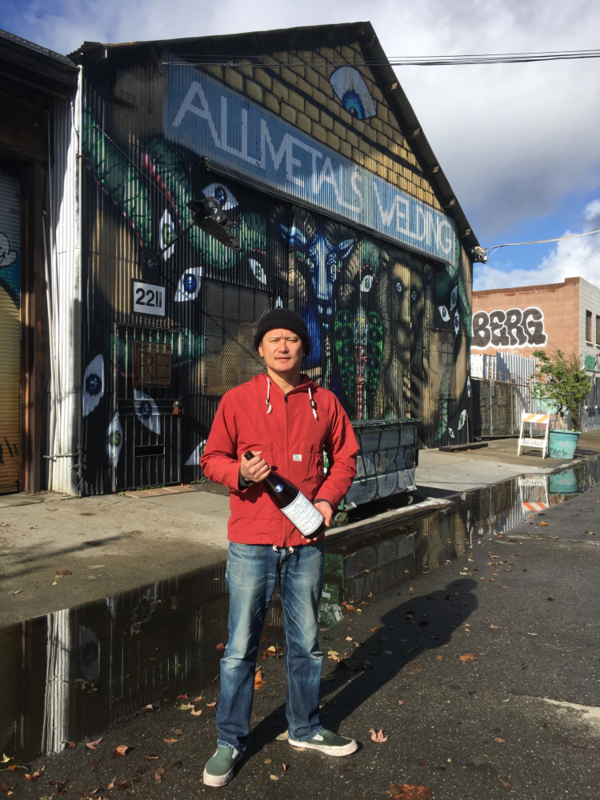 Yoshi’s background as a manager for a wine and sake store and a sommelier in California, home to a large number of wine drinkers, has meant his sake brewing is strongly influenced by wine culture. According to Yoshi, the core of wine is acidity, while that of sake is umami (amino acid). One of the reasons US people need acidity is it works to cleanse their palate for American cuisine with high protein and fat. Yoshi found that most sake made in other US breweries tend to have strong acidity. 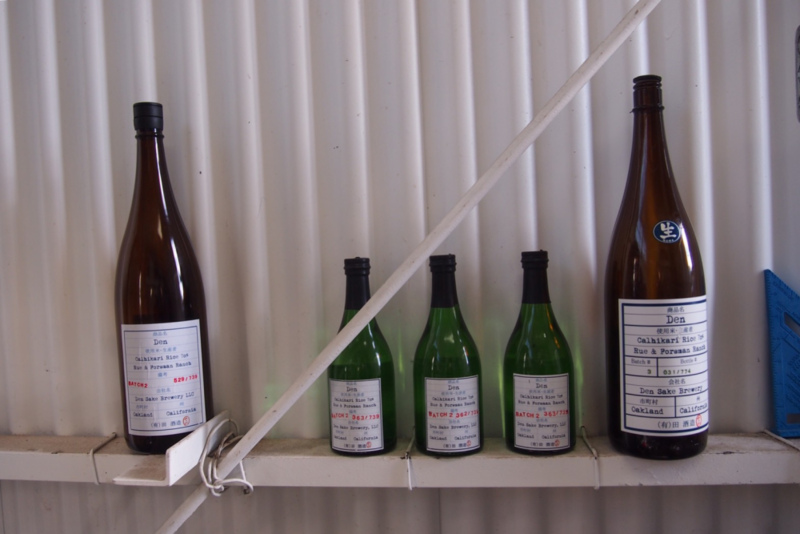 Previously, Den Sake Brewery had brewed only nama (unpasteurized) sake. At our meeting (December 1, 2018), however, Yoshi let me taste the hi-ire (pasteurized) sake he has just started producing. While Yoshi described the flavor of nama sake as ‘flashy,’ hi-ire is palatable, silky with a refreshing aftertaste. The flavor combination was indeed ricey and ‘clean’ as he explained. He pasteurizes sake by putting bottles into hot water at 70℃ (158℉). Although he would like to produce hi-ire constantly because “Nama easily gets heavier with time,” it requires too much work for one brewer. Yoshi translates subtle nuances and his own introverted feeling into a product attracting others – this similarity might have led a person who had lived with music to the journey of sake.